Amish furniture craftsmen are skilled at blending traditional and modern designs. And the Solid Wood Empire Hutch is a prime example. The first thing that meets the eye is the mullion arch in the three glass doors. And the designers echoed the arch theme in the buttress on each side of the open countertop. So the arch theme, along with the elegantly carved crown suggest a modern hutch style. Yet, one can’t help noticing the recessed doors and side panels, plus the traditional black Mission pull hardware. And these testify to the hutch’s Mission roots. But the designers made sure the Empire Hutch has all the elements sophisticated homeowners look for in a hutch. And that’s why they gave the hutch so much storage space behind the beautiful leaded glass up above. Also, the cupboard space and large drawer down below yield lots of space for silverware, china and crystal. Plus, the drawer opens full extension. So everyone gets easy access to every corner of the drawer. Wish to customize? No problem. Amish custom furniture enthusiasts will cherish the ability to customize the hutch to their heart’s content. Options include the wood specie, finish and hardware. Buyers can also select the number of doors, type of glass and unit size, among other items. 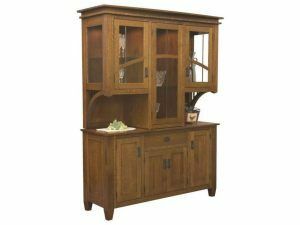 Amish artisans handcraft each Solid Wood Empire Hutch. And they use solid hardwoods, like oak, cherry, maple and hickory. Plus, they integrate skills handed down from their ancestors. And this dedication to excellence results in a piece that is not only timelessly designed, but durable enough to last for generations. Online presentations of Bradenberry furniture are great. But there is no substitute for seeing, touching, smelling – and experiencing – the furniture for yourself. That’s why you need to visit Brandenberry Amish Furniture in Shipshewana, Indiana. And among the many experiences Shipshewana has to offer – like Amish farms, Amish food and flea markets – the most solid is your visit to Brandenberry Amish Furniture.